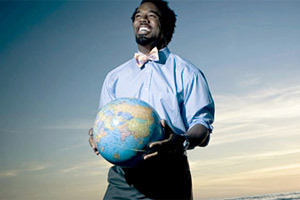 Published: May 17, 2011 at 06:05 p.m.
Dhani Jones isn't just a successful linebacker for the Cincinnati Bengals. He's not just a man wearing a bow tie, either. Jones is a true Renaissance man whose range of interests include writing, painting, surfing, music, fashion, movie reviews and education. He has his own show on the Travel Channel, "Dhani Tackles the Globe," a book titled "The Sportsman" that covers some of his greatest sporting adventures from around the world, and several entrepreneurial endeavors including bowtiecause.org and VMGCreative. Recently, I had a chance to chat with Jones about everything from football and wrestling, his love of photography and where the whole concept of wearing the bow tie started. NFL.com: You've been all around the world and had some incredible life experiences. Is there one that was the most memorable? Jones: That would definitely be my trip to Nepal. Just the climbing and hiking. When you get up there and you're at altitudes of over 15,000 feet, can barely breathe, and your mouth becomes so dry that your tongue sticks to the top. It felt as though with every step closer to the destination you're going to fail. That's one of the most powerful places. Also, being surrounded by one of the most majestic scenes that you've ever been a part of -- It was quite profound. NFL.com: You're synonymous with the bow tie. Why did you decide to start wearing them? Jones: The bow tie started off with one of my friends, Kunta Littlejohn. He said if you want to be anybody, you've got to rock the bow tie. I dismissed it at first, but later he told me he had non-Hodgkin's lymphoma, so I decided to wear the bow tie to support him. And as he got better, I came to learn the power of the bow tie. There's four main pillars to the bow tie -- self-representation, service, collaboration and critical thought. You have to understand how to represent yourself and critically understand how to collaborate and serve others. If you want to serve or represent yourself or collaborate and critically understand how to do all this, you have to educate and be educated. That's the knot of the bow tie. NFL.com: In your book, you mention you're a wrestling fan? Will we see you in a WWE ring during the lockout? Jones: Everything's a possibility. You know you got Chad Ochocinco jumping on a bull for kicks. I'm not sure that's something I'd partake in. I mean, when I was in Mexico City I did some bull fighting, but a 1,500-pound bull, getting on him for the first time might be a little bit challenging. You saw that with Chad -- he was only on for 1.5 seconds. But when I was younger I used to wrestle, and I feel that it contributed to my athletic ability because as a wrestler you have to be an all-encompassed athlete. You need stamina, strength, endurance and mental capacity. You also have to learn how to adapt in any situation. In the book, that's how all the sports helped me in my strategies for football and life. NFL.com: What else have you been doing during the lockout? Jones: I've been focused on philanthropy, the bow tie cause and allowing people to understand the true power of the bow tie. I went to speak at the University of Georgia to talk about social responsibility and entrepreneurship. I've also been focused on working out, running and cross training. These are all the sports that I've picked up and learned and applied to my training capacity so I can maintain a fresh way of becoming a better athlete. I think in a lot of ways the lockout is good because you really get to test your abilities as an athlete and how you can adapt, practice and train in different ways much like I did in the "Sportsman." I'm also focusing on player development, and have an agency called VMG creative that helps other players become brand-ready. I think this is crucial when you come into the league and sit down with a brand that wants to work with you. NFL.com: You also have a strong interest in photography. If you could shoot one event in the world, what would it be? Jones: In terms of actual real events, being a football player I would love to shoot the Super Bowl. I'd love to take on a different perspective. Of course, I would also love to shoot all of the Olympic sports, and all the days of the Olympics. If I had a free pass to shoot anything, it would be the Olympics. It's not necessarily about the sports but it's about the athletes themselves. Even in football, it's about the faces of the athletes. There are some tremendous photographers who have taken pictures of athletes and shown their faces, showcased their expressions and mindset. I think that's what I would like to do to -- add a different perspective to showcase the spirit and soul through photography. NFL.com: When you were released by the Eagles and Saints, did you think your football career was over? Jones: I had always prepared for that because everyone knows the NFL stands for "not for long." So I was at a point where I had to sit in my house, work out, train, but at the same time but remember that football might not continue for me. Maybe I would have to take a different route. But falling back on my University of Michigan education, I knew I'd be alright. That's not to say that I don't appreciate and love football. I gave all of my effort when I was down in New Orleans during training camp, and I gave all of my effort when I was picked up as a free agent by Philadelphia. In the words of one of my coaches from Michigan, you have to be able to bounce back. So I bounced back, ended up in Cincinnati and have played there for the last four years, tackled the globe for the last two and led the team down a bumpy road, but we've been successful. Of course, we've had some failures too, but we've grown as a unit. NFL.com: As a free agent, where do you see yourself playing in 2011? Jones: I want to be in Cincinnati. They've taken incredible care of me, they've provided me with a tremendous amount of opportunity, and I've only seen growth. So when I think about football, I think about a place where you have growth, opportunity and comradery. For me, Cincinnati has been that place. Now you never know how you're going to fit into someone's equation. So ultimately, it's not up to you. I'll weight the options and see what's appropriate.